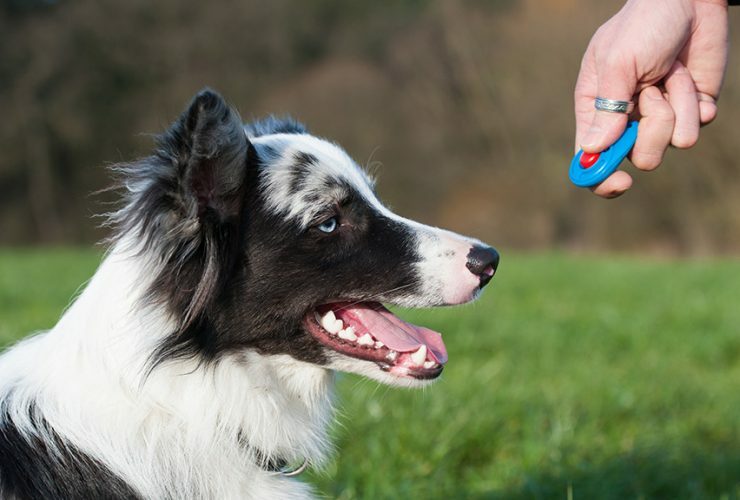 Raise your hand if you’ve ever heard the term “Clicker Training” and scratched your head at the notion that a clicking sound could help you train your pet. If your hand is in the air, you’re NOT alone! This post will attempt to clarify the mystery behind clicker training, and perhaps inspire you to try a new training method with your dog or cat (Yes, cat. We’ll get to that part later). The cool thing about clicker training is that it is rooted in science. As someone who studied psychology for many years, this concept has got me so pumped! 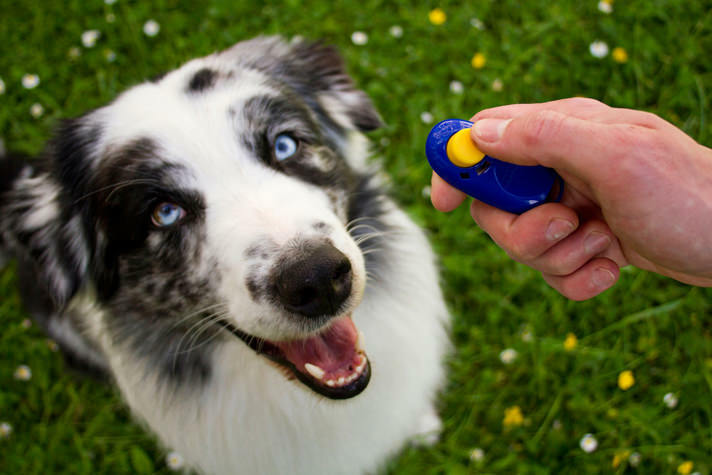 Clicker training is a facet or tool of positive reinforcement. It was actually developed by marine mammal trainers. When trying to work with an animal who could easily swim away, but was participating in positive behaviors on the other side of the pool, trainers had to come up with an auditory “bridge” to let the animal know they were doing something right, if they couldn’t administer the reward (a food treat) immediately. Through a process of “charging” the clicker (which we’ll talk about in a bit), the trainer communicates to the animal in question that they just did something positive, and a reward is about to follow. 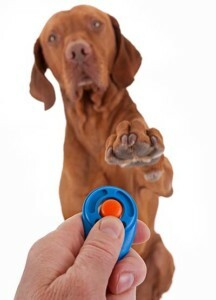 Another awesome thing about clicker training is that the precise sound of a “click” acts as a behavioral snapshot. It captures the specific behavior an animal exhibits so that you can shape behavior without even asking for it! For example, you want to teach your dog “sit”, but obviously they don’t speak english or understand what the word “sit” means. But, with a clicker, you can “capture” every every sit your dog offers throughout a training session, and eventually they will learn that putting their bum on the ground is a positive thing. You never even have to train the command “sit”, you just let them offer positive behaviors and reward them when they do! Now you may be thinking, if I’m just waiting for my pet to offer positive actions, how do I stop them from doing something bad? This is where extinction comes in! Because we’re using positive training, the goal is to reward the behaviors we like and ignore the behaviors we don’t like. For example, if your dog constantly jumps on you to get attention, but you ignore them, they learn that behavior is unsuccessful in trying to gain that sought-after attention. Therefore, they slow down the jumping-up, because they learn it doesn’t work. Eventually, the jumping stops altogether. BUT they key to any successful training is consistency. If you give them attention one time, they learn that if they continuously jump, they earn the attention they so desperately seek, and it sends a mixed message. Obviously we aren’t working with marine mammals, and don’t share the difficulty of rewarding an animal who may be far away from us. 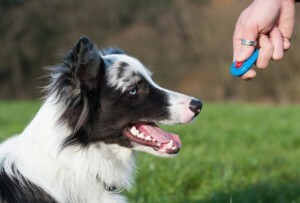 So why do we use clicker training? Well, its a tool. Humans are a little bit clumsy and a little bit inaccurate. We fumble with treats and rewards and praise can be inconsistent. We sometimes use our body in unintentionally positive or negative ways. A clicker on the other hand is a precise marker of positive behavior. It doesn’t require us to be perfect with our treat timing or achieve perfection with our body language. All we have to do is click when we see a behavior we like, and not click when we see one we don’t like. That’s it! Clicker training is a TOOL. This is not intended to last forever! The clicker is merely a tool to help you better communicate with your pet, that’s it. One you have open and clear lines of communication, the goal is to phase out the clicker altogether! Now we’ve got the basics down, so what’s next? Well, you’ve got to charge your clicker. If you think about it, the same way animals don’t speak english, they also don’t speak clicker. Therefore, we have to teach them what the clicker means! This is the fun part: you simply have to do several rounds of “click, treat, click, treat, click, treat, etc.”. Practice charging the clicker several times in 5 minute intervals. Not only will this teach your dog what the heck you’re doing, but it will help you with your clicker timing and consistency. Sometimes getting the feel of the clicker in your hands is the trickiest part. Here’s the time to choose what you’d like to work on with your pet. The easiest thing to do is allow them to offer you behaviors and you can capture the ones you like and ignore the ones you don’t. For example, if you’re working with a high-energy dog, I would recommend clicking every time they are quiet, have 4 feet on the floor, sit, or lay down. You can even try “shaping” their behaviors. Another example: you want to teach your dog to shake but don’t know how to start. 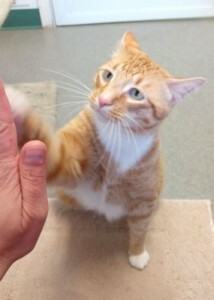 You can start with a wide criteria: every time they lift their paw off the ground, you click. Then, slowly narrow your criteria to include only the times that their paw heads in the direction of your hand. Finally, only click when their paw makes contact with your hand. 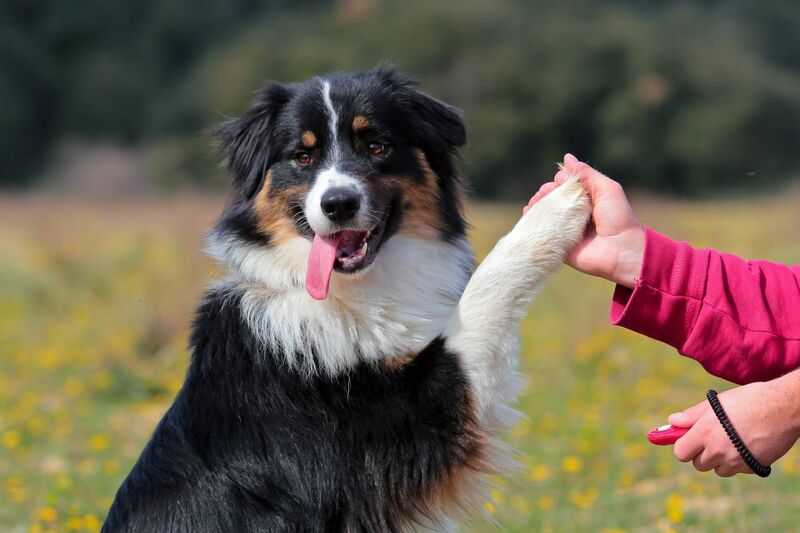 This may take several sessions of training, but eventually it will “click” with your dog that you want them to shake your hand! The great thing about clicker training is that it is SO versatile. When you take a reward that every living being likes (such as food) and pair it with your clicker, you can create a training scenario. 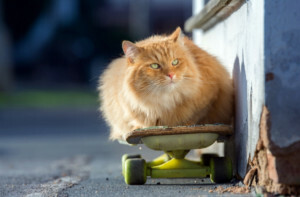 Therefore, you can absolutely train cats as well! For example, if you have a cat who is constantly on the countertops, you can actually click them onto the floor. As always, start by charging your clicker. 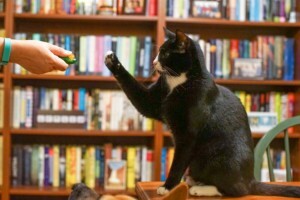 Once your cat gets the idea, you click every single time they jump off the counter on their own. Finally, they’ll learn that they get more rewards by staying on the floor! So there ya have it – clicker training in a nutshell! My challenge to you: give clicker training a try and let us know how it goes!